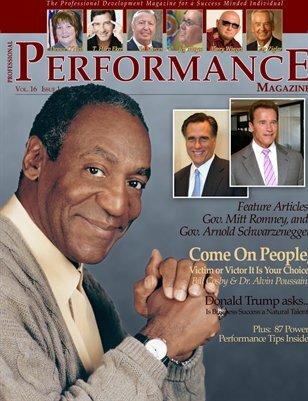 This very special Spring 2008 issue of Performance Magazine features an article written by comedian, and author Bill Cosby. We've got even more exclusive interviews and articles with Mitt Romney, California Gov. Arnold Schwarzenegger, Les Brown, Lauren Solomon, Jim Stovall, Alan Weiss and the no-nonsense motivational speaker and author Larry Winget.